Sometimes we wish we could go back and capture an opportunity that we’ve missed. Sometimes those opportunities are root beers that we wished we’d bought when we saw them on sale. Sometimes, years later, we find those vintage bottles and wonder, could this really be a second chance? Often I’ve had those thoughts, yet I’ve never bought those old bottles that you see sometimes on Ebay and the like, figuring that they’d be long past the date where they’d taste remotely like they originally did. But a month ago someone posted on a Facebook group that he had a bunch of root beers, only 10 years old. I spied some that I’d missed, Hires, Journey Great Northern, and Sonora. He said they were only $10. Which sounded like quite the deal. With shipping it should only be around $20 which isn’t too much to risk unreviewably old brews. Maybe one or more would still be good. I told him that I’d buy them. After some back and forth about Payment the final total came to $40, which I wasn’t very pleased about. I mean, I know you can ship flat rate USPS for only $12, so his initial $10 had ballooned into $28 which is way more than I wanted to pay for such a thing, but I figured I’d go through with it anyways. The first one I tried was the Journey. Journey brews have always been horrible, so maybe the horribleness of being really old would be indistinguishable from it’s original flavor and I could get a review from it. The first thing I noticed was that there was no carbonation left. It didn’t smell like root beer either. It tasted fruity and syrupy and utterly unlike root beer. The flavor can best be described as when you get a snow cone with every flavor of syrup, let it melt, and then drink the results. Not good at all, and clearly not what it originally tasted like. It wasn’t reviewable. What a disappointment. I pressed on though, and tried Hires, with similar results. Oh well. Sonora seemed like it wasn’t quite as old. There was still some carbonation and a hint of vanilla amongst the snow cone syrup flavor. Still way gross and still not root beer. I’d like to say it was a waste, but it wasn’t, it was very informative. Now I wonder what some of those vintage bottles from the ’60’s taste like, snow cone syrup, or something different all together. 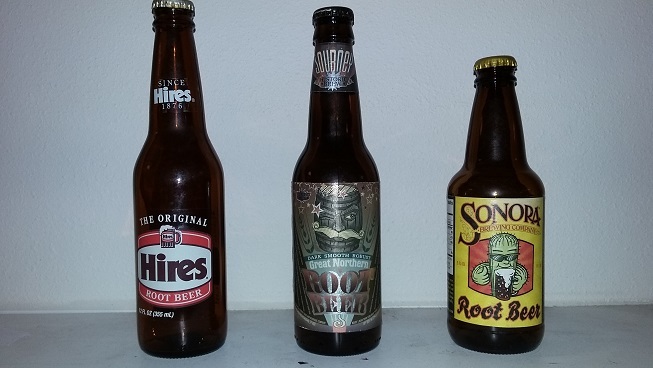 Is it the fate of all old root beers to eventually degrade to the same strange state? At what age to they stop changing? I intend to find out, but not immediately, I’ve got real root beers to drink. But fear not, I’ll get to the bottom of this, for science, and for the love of root beer.